Before I bring up the equipment I used, note that the trip I took was a bit atypical. 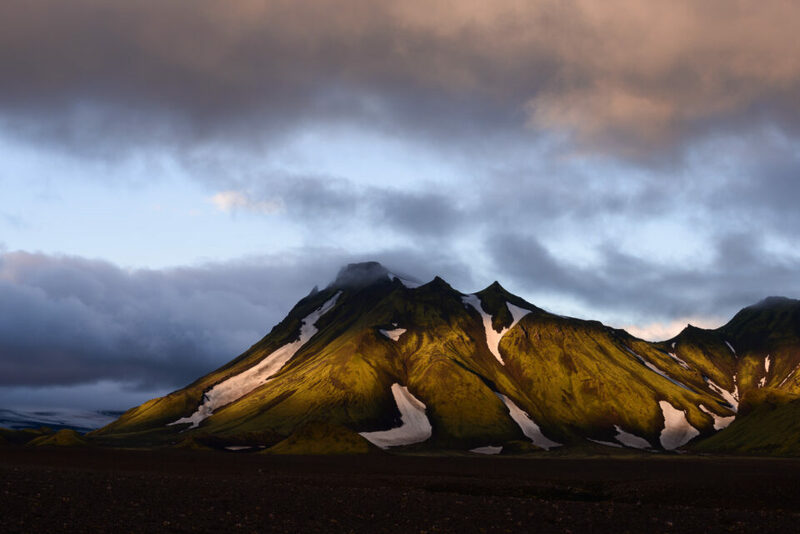 Not only did I bring a lot of camera equipment on the Laugavegur – more than anyone else I saw along the way – I also lived on a reverse schedule during the hike, sleeping during the day and taking pictures at night. The simple reason for this decision is that it was the easiest way to stay awake for both sunset and sunrise, which occurred around 11 PM and 3 AM respectively. It never got too dark in between, and there was always enough light to hike. Not to mention that it reduced the crowds! The list below summarizes the main pieces of equipment I brought on the Laugavegur hike in Iceland, as well as the rating I’d give each one. I’ve included both camera equipment and hiking/camping gear. I hope it goes without saying, but I don’t have a relationship with any of these brands. All the recommendations below are unsponsored and mine alone. 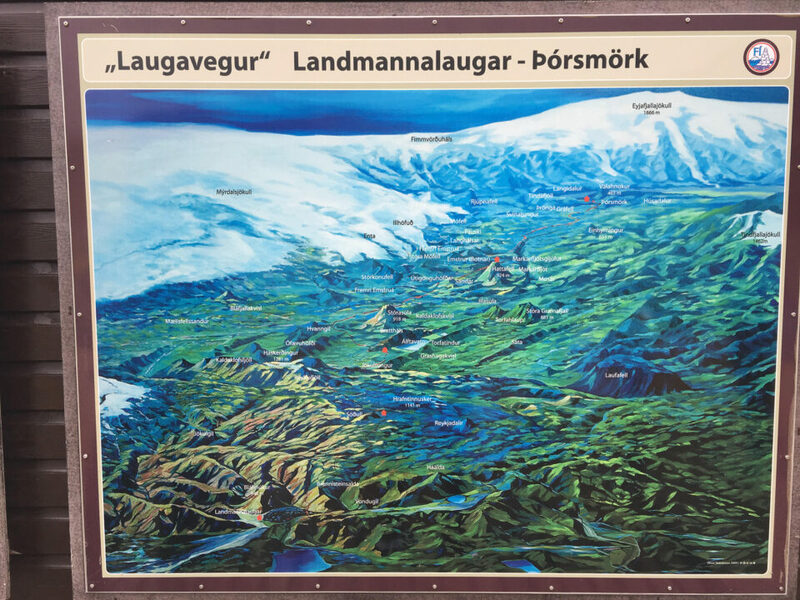 A map of the Laugavegur from start to finish (though, at the end, you can extend the hike beyond what is shown here, which is what I did). It looks deceptively short like this! It’s not the newest camera on the market, but it’s tried and true. Mine worked just as well on the Laugavegur as it’s worked on other trips for the past several years. The D800e doesn’t have as many features as the newer D810, let alone the D850 – but if you can’t get good landscape pictures with it, the newer ones won’t solve your problem. The weight is more than would be optimal, but the impressive battery life and durability make it worth carrying along. The 70-200mm f/4 might just be my favorite Nikon lens of all. It’s sharp and much lighter than the f/2.8 version. It almost crosses into A+ territory, but the weight isn’t ideal for a hike like this. If that’s your top priority, you may be better served with a prime lens like an 85mm, or even the newest 70-300mm f/4.5-5.6 AF-P FX (if it’s compatible with your camera), either of which will lighten your pack a bit. You can read our review of the 70-200mm here. This was the first trip where I’ve used the Tamron 15-30mm f/2.8 rather than the Nikon 14-24mm f/2.8, and it lived up to its impressive reputation. The only problem? Weight. This lens is even heavier than the Nikon 14-24mm, which is famous for its bulk. Ignoring that issue, I was impressed by the sharpness, flare performance, and water-repelling front element. On balance, I like it slightly more than the Nikon 14-24mm, at least for daytime work. (I haven’t had time to try it for the Milky Way yet.) Check out our 15-30mm f/2.8 review if you like. I love this Really Right Stuff tripod. It may be the only piece of my current camera kit that I expect to be using in ten years. The only reason it gets a lower grade is weight, which, at 1.5 kg (3.3 lbs), is noticeably more than some good travel tripods on the market. Wind conditions on the Laugavegur were calm enough that I could have gotten away with something like the Gitzo Series 1 Traveller, or RRS’s own TFC-14, without too much of an image quality penalty. The same goes for the RRS BH-40 ball head – it’s a great piece of equipment, but the lighter BH-30 would have served just as well on the hike. That’s not to say in general I would prefer a lighter tripod/head kit. The conditions on the Laugavegur simply demand closer attention than usual to the weight you carry. In this case, a different set could have saved at least one pound/half kilo without a noticeable penalty, and that counts for a lot. I knew ahead of time that the campground on day six of my hike (at a place called Thorsmork) would have outlets to recharge batteries, so I brought along a charger from Ravpower that I quite like. It’s slow, but it is lightweight, and it can charge two batteries at once via USB. I also brought along a 10,000 mAh battery pack, of which there are dozens of good options on the market. The charger can be found here on Amazon for $38, a price that impressively includes two off-brand EN-EL15 batteries as well. This was a relatively good number of Nikon EN-EL15 camera batteries to carry on the Laugavegur. It turned out that I could have gotten away with fewer – especially with the ability to recharge at Thorsmork – but I didn’t want to take any changes. The greatest number of dead batteries I ever had at a time was four. Still, I did this hike during some cloudy and rainy conditions, so I probably took fewer photos than I would have in better weather. I knew from past experience that my photos from this trip needed to be in at least two places at all times, and three places as soon as possible. This involved setting the D800e to write simultaneously to both cards, then using the camera’s fantastic “Copy” feature to copy the photos to a separate SD card at the end of each day. I then put the backup SD card in a weather-resistant card wallet from Ruggard, which was a bit heavier than ideal, but far lighter than any sort of hard drive backup system would have been. The icing on the cake was to give the card wallet to my hiking partner, which ensured the photos would survive even if my camera fell in a river.